Presented by New Pro Star Sdn Bhd, the korean kpop group AlphaBAT is coming back to Malaysia to perform during Hari Raya season ! AlphaBAT with a total number of nine members ,Beta, Code, Delta, Epsilon, Fie, Gamma, Heta, Lota and Jeta. AlphaBAT last visit in April was overwhelmed with attention and reports from major newspapers, radio, TV and social media. All of their showcases were full house whereby their fans followed the tour all the way from Johor Bahru to Ipoh. During their last visit, there was an audition for 10th member, and 3 Malaysian finalists were chosen. This time, the CEO of Simtong Entertainment (management company of alphaBAT) will come to Malaysia to have a final audition. Hopefully we have a Malaysia’s first Kpop group member. The final audition will be held on 10thAugust 2014 at 1Shamelin Shopping Mall. AlphaBAT will also bring their album and limited edition merchandise for sale! Fans with merchandises and album can grab a chance to get their autograph on stage as well. For more updated news of AlphaBAT, please visit New Pro Star Sdn Bhd Facebook page, www.facebook.com/newprostar.my. 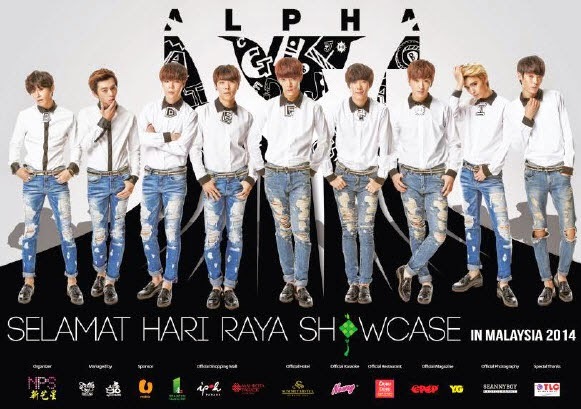 or call 012-2026027 or more details of AlphaBAT Hari Raya Showcase.